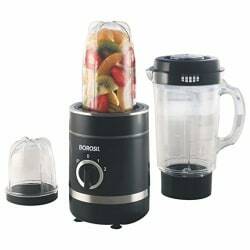 Borosil NutriFresh Blender and Grinder 400W, Black. Brand - Borosil, Product Name - NutriFresh Blender, Color - Black, Specification - 400W Motor with 100% Copper Winding, Rated Voltage : 230V~ 50Hz. Motor RPM : 20000 Approx. 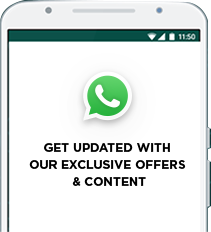 3 Polycarbonate Jars (Unbreakable), Blending Jar (PC) : 1L Smoothie /Blending Jar(PC):500ml,Dry Grinding & Chutney Jar : 300ml. Grinding & Blending Functions, Smoothie Maker, 3 Unbreakbale PC jars, Rotatroy Switch With 2 Speed And Pulse Function, Inbuilt Jar Locking Switch For Extra Safety, Stainless Steel Blades For Fine Grinding And Blending. Blue LED Light Display For Better Aesthetic Look, Lid For Containers And Spice Seasoning Attchedment Included, Detachable Blade Attachements & Containers, Cord Winder At Bottom. Variable 2 Speed With Pulse Function, Durable Plastic Jars And Containers, Long Power Cord For Convenience, Easy To Use And Clean. Package Contain - 1N Motor Unit,2N Blending Jar ,1N Grinding Jar ,2N Blade Atachements,1N Spice Seasoning Attachements ,1N Jar Lid Cover,1N Instruction Manual. Unit Dimension - L - 248mm X W - 133mm X H - 265mm. Master Package Dimension - L -511mm X W - 408mm X H - 585mm.Net Weight - 1.8Kg. Price alert for Borosil NutriFresh Blender and Grinder 400W, Black.